Handy Backup allows you to filter files and folders for data backup. You can use file filtering to include or exclude some files when you backup a dataset. For example, using a data filter that selects .AVI files from a drive allows you copying your movie collection only, without other files on that drive. The file mask like *.mp3 will select all MP3 music files in your folder or drive. The mask beta??? ?.docx will select DOCX files with 8-character names beginning with "beta". The mask for a name myproject. * will filter for backup data only files called "myproject", regardless of file extension. Note: You can add a filter for backup data on Step 2 of a new task wizard, by clicking onto the File Filters... button in the lower right position of a window. Another type of data filter is by attributes; it can select or unselect system, hidden, temporary and archive files. Using these filters often allows data filter software to exclude big but unwanted files (especially temporary files) from a backup set. 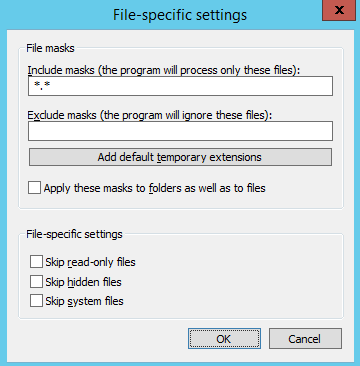 Note: Not all programs will use attributes, so you may combine attributes and file masks to make a proper dataset for file filtering software! Use file filtering backup to optimize your storage space and efficiency of backup operations!